Ensure your safety: Safety is always priority number one. Be aware of all potential dangers. If in doubt, stay out! Assess the storm damage: In most cases, storm damage will be obvious as water pours through your leaking roof or is driven by high winds through broken windows. In other cases, such as after a hail storm, the damage may be less obvious. For example, your roof may have imperceptible ‘dings’ in the asphalt shingles after a hail storm. These dings will slowly deteriorate, eventually causing roof damage or water leaks. You may want to have your roof inspected to ensure its integrity. Mitigate the storm damage: Next, it’s important to secure your home from further damage. This could mean boarding up a broken window or putting a tarp over a damaged section of the roof to keep more water from pouring in. Similarly, if your home has been flooded by a storm, not only can we extract the water and begin the dry-out process, we can help mitigate further water or mold damage with our fast response and structural drying techniques. 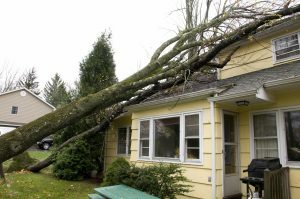 Call your insurance company and us: Significant storm damage is typically covered by your home owner’s insurance policy, making it important to notify your insurance company of a loss right away. The sooner you call us, the sooner we can secure your home from further losses. Roof, window, and siding repair: High winds, heavy snow, pounding hail, and torrential rains can all wreak havoc on a roof, siding, and windows, making residential roof repair, window replacement, and siding repairs some of our most requested services after a storm. Water extraction services: Whether a nearby creek or river has overflowed its banks and flooded your home or water has intruded due to a leaking roof or broken window, the first order of business is water extraction. In addition to removing the water, we will need to fully dry the structure, and clean, sanitize, and deodorize your home. Our truck-mounted water extraction units extract water from your home quickly and efficiently while our team of IICRC-certified flood specialists will clean up the aftermath promptly. Interior restoration services: Water damage often extends to your home’s floors, cabinetry, drywall, and electrical systems, making it important to work with a storm damage specialist who can quickly dry out your home so that any structural damage can be assessed and repaired promptly. Here at Modernistic, we understand that storms don’t adhere to a 9-to-5 schedule, so we don’t either. We’re available 24/7 for emergency storm restoration services. Whether your home has been inundated by a natural flood, a storm, sewage overflow, or a sump pump failure, you can count on us for a fast, professional response. Contact us now if you need help in restoring property damage after a storm.